The Law of Civil Rights and Civil Liberties: A Handbook of Your Basic Rights, by Edwin S. Newman, Oceana Publications 1949. In 1949, racism was still firmly rooted in the laws of many individual statest in the United States of America. 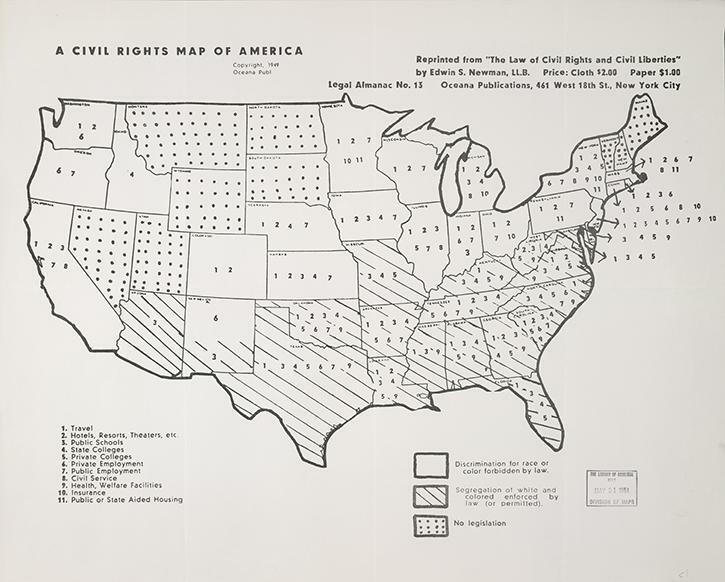 States without stripes or polka-dots had laws in place forbidding discrimination. Striped states enforced or permitted segregation. States with had no laws in place bear polka dots. Numbers indicate the passage of laws either supporting or condemning segregation in particular arenas of public life.